Much of KMOV’s imagery is inspired by rapid change in the Chinese urban landscape. At the intersection of the demolition of already decrepit architecture from the 70s and 80s and the buildings currently being constructed, there is an interesting phenomenon of past being recycled into the future. Visually, the new massive forms in the construction sites that fill the horizon are quite impressive: hulking cement skeletons wrapped in green cloth and irregular grids of bamboo scaffolding. 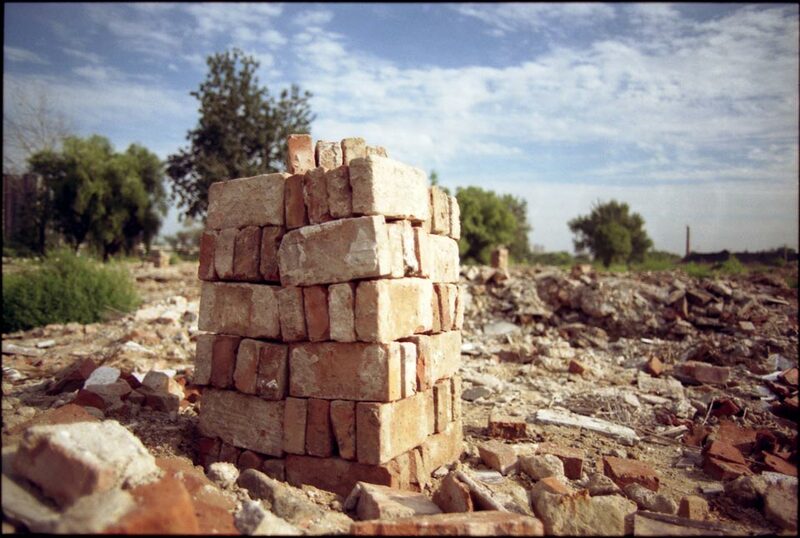 Old buildings in the construction sites are demolished by itinerant workers who are paid per brick to recycle and stack still usable bricks for future use. At night, blooms of torchlight appear from within the fabric, and clothes hung out to dry in the uppermost unfinished floors of a building evidence their presence. Daylight reveals wide swaths of brick and rubble remains, re-organized to appear as if they were rough maquettes of the buildings to be, or cityscapes of the future. What happens in the transformation from slum resort? How can we document the ethereal beauty of the craftsmanship of these itinerant construction workers, these invisible artists? There is a symbolic relationship of the under- construction buildings and the veil-like cloth in which they are cloaked to a human body. How does this correspond to the de-construction, construction, and regeneration in our own lives? In these surreal sites, we feel ourselves treading a moving line of balance between chaos and order.